Ditch the paper towels and let our Kitchen Cloths and Towels help you effectively dry your cups, dishes and silverware; wipe and clean your sink and dirty countertops, and so much more. These extra-absorbent and lint-free microfiber cloths and towels will help you grab, trap and eliminate kitchen messes using only water. Works great on all types of hard surfaces, including stainless steel, enamel, ceramic, glass, chrome, granite, marble, wood, tile and china. Contains our powerful BacLock®* antibacterial agent. Available in 6 colors: Orchid, Pomegranate, Blue, Graphite, Latte and Sea Mist. 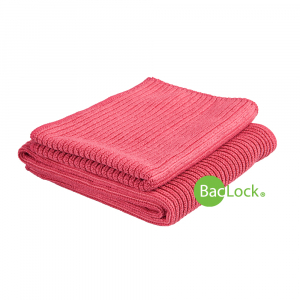 Cloth size: 35 cm x 26 cm / 13.78" x 10.24"
Towel size: 65 cm x 35 cm / 25.59" x 13.78"
BacLock*, the micro silver agent in the cloth, goes to work with selfpurification properties against mold, fungi and bacterial odor within 24 hours so that it is ready to use again.